Description: In homage to Huntsman client Paul Newman, Prohunter has given this watch a Huntsman bespoke treatment. 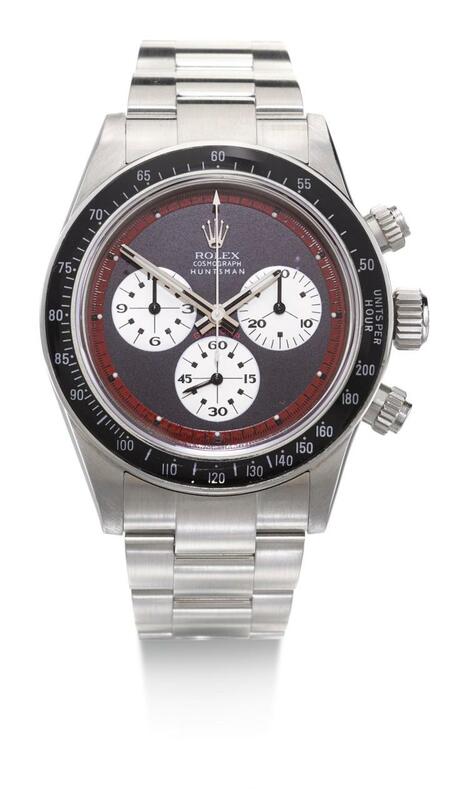 The Daytona sports a classic black dial, with printed batons and Paul Newman style sub-dials in two striking colours, with Huntsman Claret minute markers. All original Rolex parts were used by ProHunter to create this limited edition of 11 pieces - this is number 11, the last available. Condition: Movement running at the time of cataloguing. The dial and hands in very good condition. The case too in very good condition, the crown guards have been removed. Overall the watch appears unworn. The watch has not been tested to determine the accuracy of its timekeeping. Please note that Sotheby's does not guarantee the future working of the movement and that a service may be required at the buyer's discretion.